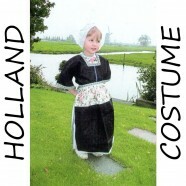 Traditional Dutch Holland Costumes for boys and girls including head cap. These traditional costumes are still worn by many men and women in Volendam. 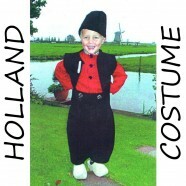 Costumes are available in different sizes from 0-14 years. Matching wooden shoes and/or clog slippers are available separately.